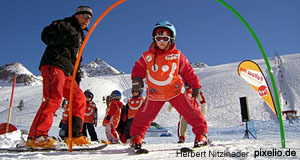 In the past twenty-odd years, Austria′s skiing areas underwent an increasing amount of competition due to various factors. Domestic competition got fiercer, some eastern European countries have opened their boarders and economic difficulties in Germany forced hotels and tourism companies to look for new markets. The results of this development can be seen in various areas of Austria′s skiing industry - most strikingly in the formation of marketing unions. There are various ski lift companies that have formed unions and platforms, associations and communal brands. The biggest of these is the "Ski Amade", obviously referring to Wolfgang Amadeus Mozart. What do Mozart and skiing have in common? Not very much, I would say. They are both pimped out as much as possible by Austria′s ever-selling tourism mafia, which is probably enough to explain the name. The Ski Amade area combines some of Austria′s most popular skiing areas. It spans 28 muncipalities in the provinces of Salzburg and Styria. 270 ski lifts and cable cars transport skiers and snowboarders in the Ski Amade. According to own announcements, this makes the Ski Amade the largest skiing area in Europe - before you get all crazy about this, it is worth noting that it is not a connected area at all, but at least two regions: One with its core in southern Salzburg, the other one around Schladming. Nevertheless, the Ski Amade is indeed extensive and offers pretty good and modern infrastructure. It all stated in the late 1980ies, when lift operators and tourism councils of the entire Pongau region in Salzburg formed an alliance that first accepted each other′s tickets, later established a common brand and advertising strategy. Only a few years later, this union grew and turned into a "federation" with a single ticket for all facilities, a ban for members to issue tickets exclusively for a single area and a centralised administration. This caused some trouble with a feared monopoly, and unions went into negotiations with the Ski Amade regarding its cartel position. As a result, the Ski Amade board agreed to present the key for the determination of rates in 2004. At the same time, they agreed to assign a certain amount of money for innovations and modernisation of the infrastructure of the skiing areas. Criticism regarding high prices has not completely ceased since then. Considering the principles of the free market with supply and demand, even critical minds will have to admit that the high rates did not harm the popularity of the Ski Amade areas. The Ski Amade union contains various small skiing regions that have existed before and that often still pool advertising efforts. It is the "Salzburger Sportwelt", the historic core of the Ski Amade; the region around Schladming, called "Dachstein Tauern"; the valley of the "Gasteinertal" and "Großarltal" and the area "Hochkönigs Winterreich" at Mount Hochkönig. In the following, you find the individual municipalities of the Ski Amade arranged by sub-region.